Home » News » South Fork Commuter Connection starts 3/4! operate during peak commuting hours, in order to provide workers with a public transportation option to travel. This service starts March 4th, 2019. It will operate Monday through Friday year round, except for major legal holidays and Fridays during the summer. The service offers local LIRR trips, stopping in Speonk, Westhampton, Hampton Bays, Southampton Bridgehampton, East Hampton, Amagansett and Montauk. The LIRR fare is $4.25 each way, which includes the train ride and local ‘last mile’ shuttles services. 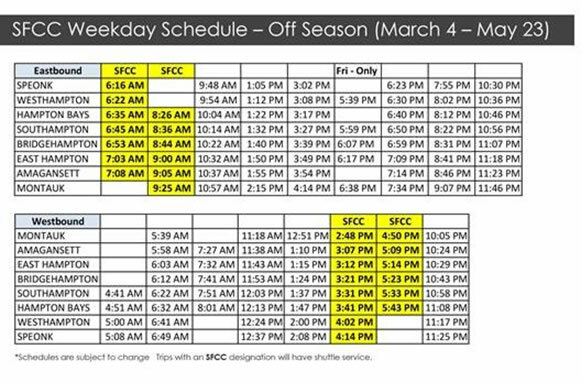 Below is the LIRR service schedule beginning March 4th and operating through May 23rd. Trips highlighted in yellow with the SFCC designation will offer connecting ‘last mile’ shuttle services. The summer schedule will be posted in May. Your feedback is important to the Town’s Transportation planning process. New Bid Process: All Vendors Must Re-Register! 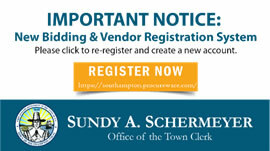 If you’re a Town of Southampton vendor and/or interested in getting bidding and procurement request updates, you must register now on the Town’s website. The Southampton Town Board granted a 2-year extension on the amortization of existing signs in the Town. As discussed in prior newsletters, under current sign code, pre-existing signs would now have to come into compliance with new code in 2 years. We have already met with Councilman Tommy John Schiavoni on this matter, and will be working to permanently grandfather existing signs before the next deadline. Thank You – New Corporate Sponsors!